From the earliest days of her arrival to England as the beautiful, vivacious Danish princess come to wed the Prince of Wales, Alexandra set the fashion trends of the late Victorian and Edwardian eras. Her most lasting trend was the wearing of dog collar necklaces and chokers, alleged to hide a surgery scar on her throat. The trend for ladies to carry bejeweled walking sticks was said to have begun with the “Alexandra limp”–another fashion craze borne from her adaptation to an illness. 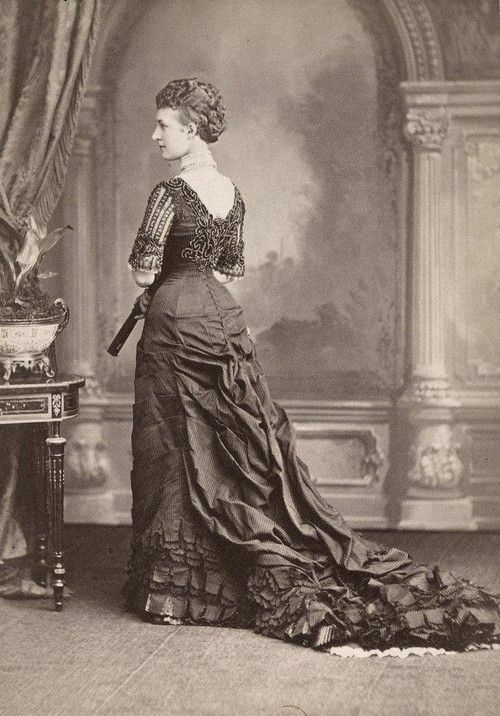 Queen Alexandra has never aspired to be an arbiter of fashion, as she dislikes change and never makes experiments in novel costumes, but her influence has been a subtle one. To her we owe the undying vogue of the tailor-made and the long plain skirt defining the lines of the figure. She has never abandoned this style, and by her example has discouraged repeated attempts to introduce the hooped petticoat and skirts flounced to the waist or in any way overloaded with trimming. though it has long ceased to be the exclusive fashion. The close-fitting toque, well displaying the toupée in front, has in Her Majesty’s case succeeded her favourite Princess bonnet, and close-fitting skirts with trim bodices have replaced the Princess gown. The pointed corsage is the Queen’s favourite style for evening. Occasionally the Queen wears a blouse, but it is never at all full, or deeply pouched, and the sleeves fall softly and gracefully, with an utter absence of bunched-out effect. But though the Queen may don a blouse occasionally for morning wear, she prefers the skirt and bodice of the same material, as it does not break up the lines of the figure. To summarise the Queen’s influence on modern dress, we are indebted to her for discountenancing the efforts made now and again during the past twenty to thirty years to re-introduce either the crinoline or the stiffened petticmt, and for keeping in permanent use the graceful, plain skirt. She has further discountenanced the trailing dress for outdoor wear, and established the vogue of the tailor-made gown, in which the limit of simplicity is reached. AGAINST WASP WAISTS AND HIGH HEELS. The healthy influence exercised by the Queen is also apparent in the rebound against tight-lacing, which hrs held its ground for so long. The Queen is not an admirer of the wasp waist. She isagreat admirer of a trim and Well-defined figure, but believes that this can be attained best by attention to fit and cut. In such matters the Queen is fastidious to a nicety, and never overlooks a crease or a wrinkle in the fit of her clothes. Her garments are fitted over an exact model of her figure, which ensures perfection of fit, and saves Her Majesty the fatigue of trying on. As the Queen’s example has been directed against the wasp waist, in like manner her influence has been opposed to high heels and compression of the feet. Her Majesty wears a small five in boots, and achieves daintiness by perfection of fit and cut. With regard to colours, in years gone by the Queen was very partial to blue. To her influence is due the long popularity of black and white, a combination which can be made as chic as it is becoming, and is the safe refuge for the woman not gifted with an artistic taste in the blending of colours. Pearl grey, heliotrope, and mauve are now the Queen’s favourite colours and share her patronage with black and white. Dr. Kate Strasdin, royal dress historian and author of Inside the Royal Wardrobe: A Dress History of Queen Alexandra, was consultant for the Fashion Museum’s current exhibition Royal Women.” Dr. Strasdin also helped identify a long lost gown as belonging to Queen Alexandra!